Seraphim Software provides churches with a comprehensive solution for managing people, resources, facilities and events. Like an Operating System for churches, cloud-based Seraphim enables people, resources, facilities, and events to work together in sync. The solution is fully mobile - accessible via mobile from anywhere with an internet connection - and there's no limit to the number of people who can use it. Seraphim's simplistic user interface has been designed to echo Windows and Apple products, facilitating implementation for users and focusing on the specific needs of modern ministry. Church administrators can search, input and manage the people they serve, on a single screen. Visitors can be grouped statically or dynamically according to multiple demographic criteria. Dynamic groups could be people with "member" or "regular attendee" status, for example. Seraphim has been designed to maximize outreach and create intimacy between members, visitors and regular attendees. At its core, Seraphim has a digital Bible where the scripture can be viewed by verse, structure, chronologically, geography, and topically. We have been using Seraphim for a little over a year now. The migration of information from our former ChMS was quite simple and they were careful to make sure that everything was correct. It wasn't just a dump of data, but rather a person worked closely with us to be sure that everything transferred well. The features of the program have transformed the way we "do ministry" and we are still adding aspects of Seraphim to our daily lives every week. They are at the cutting edge of church technology and are adding and adapting features all the time. You can tell they are serious about getting this right and staying on the front lines. Plus, the user interface is very intuitive and clean looking. It makes even the most complex of tasks seem quite easy. By far though, the standout feature of this company is its customer support. Their website interface for customer support is informative and helpful, but the personal touch is where all the difference is made. When you call, you talk to a person that knows you and knows how to solve your issue. I once had a problem with a smartform for a large event we were hosting and the PRESIDENT OF THE COMPANY spent time out of his weekend to make sure it was solved (Saturday and Sunday). Even if you do find a piece of software that works better, which I don't think you will, I can guarantee you won't find a company that cares more about making things right and keeping you happy with their product. That is invaluable! Their customer service is second to none! The most appealing part of Seraphim is the ability to create your own filters (queries) for people based on a wide variety of criteria. Our church relies on automation as much as possible to reduce administrative paper-pushing so we have pushed this feature to the limit. Using the tools to create "groups" (queries) and even groups of groups is pretty straight forward and makes it easy to find answers to questions and figure out what you need to do with people. And while it is not a "feature," having all of the different elements of church management under "one roof" greatly simplifies administration. Before we had a dozen different systems and processes for a dozen different ministry needs. Now we use Seraphim for (mostly) everything and it makes data management a lot easier. The desktop platform relies on MS Silverlight which is not only clunky but discontinued by MS and incompatible with a lot of browsers (like Chrome). The mobile version of Seraphim does not have the administrative tools so the church admin has no choice but to use Seraphim on Silverlight. Possibly related to the Silverlight platform is the little irk that the dashboard is not responsive and therefore requires a minimum monitor size of around 17" to access all the tiles and fields. This can be a problem for a small church like ours that functions off of laptops and older computers with small monitors. The ability to take attendance of our Small Groups separately, Safe Check-In, emailing and texting directly from the program.Because it's web-based, others can use it. This will move our church forward and bring us more up-to-date. All of our info is in one spot. Easy access from anywhere. We love that our members can use this information as well.Great customer service! It is also accessible from any computer. I love that I can find everything I need in one place instead of searching through different databases or files. Our congregation has enjoyed the ability to access information via their phones. Seraphim offers a subscription, usage-based pricing model. Fees are based upon average weekly attendance numbers. Contact Seraphim directly for a quote. Send targeted messages via email, post, SMS or even phone calls read audibly to recipients. Group members statically or dynamically according to multiple demographic criteria. Dynamic groups could be people with "member" or "regular attendee" status, for example. A Bible study engine at the core of Seraphim presents the Bible in a way that it can be read, searched and shared socially. With Seraphim, the Bible can be studied topically, geographically, prophetically and chronologically by church members. Financial tools within Seraphim provide church administrators with control over contributions, contribution tracking, integrated event payment tracking and reporting capabilities. Get key insights on things such as the number of visitors attending church, where they come from, how many of them return, and how many don't. Data import / export tools within Seraphim ensure smooth migration over from existing systems. Below are some frequently asked questions for Seraphim. Q. 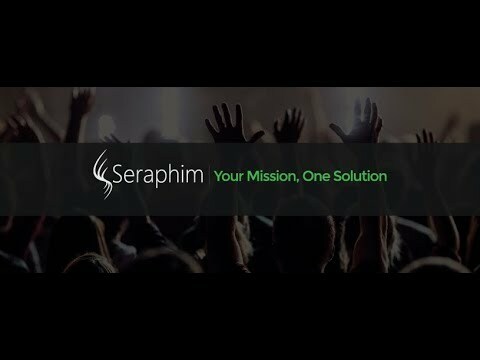 What type of pricing plans does Seraphim offer? Q. Who are the typical users of Seraphim? Q. What languages does Seraphim support? Q. Does Seraphim support mobile devices? Q. Does Seraphim offer an API? No, Seraphim does not have an API available. Q. What other apps does Seraphim integrate with? Q. What level of support does Seraphim offer? Q. Which apps is Seraphim compared to most often?